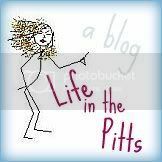 Life in the Pitts: Ok, I'll admit it. I love my job. "Helena, what is the 'You Tube'?" And it made my day. Things that also fall into that category? hahaah!!!!!! oh that is awesome!!! no wonder you can blog everyday, he doesn't know what "the blogging" is anyway!!! you didnt show him all those videos you made that you posted on there did you?!?!?! "Blogging", what is that? It sounds positively naughty. I thought you were not that kind of girl. Classic! Did you tell him the truth or show him some amazingly funny videos? ha, that's classic...in my old job, I had to explain to my boss what a mullet was - you know, business in the front, party in the back? I think your boss and my boss would be great friends!